When I hear the word “chicken noodle soup,” I have one reaction: let me eat it. That was particularly true last week when I experienced my first college illness. I desperately wanted chicken noodle soup, but my options were limited to Campbell’s Chicken Noodle Soup and Campbell’s Chicken Noodle Soup, both of which contained literally two pieces of chicken and ten noodle strands. Okay, that’s an exaggeration. The amount of noodles in the can is actually now quite impressive. Also a box of Kleenex and a laptop with Netflix. But those are inedible and therefore irrelevant in life. Anyway, I proceeded to perform my signature masterchef maneuver; I put everything in a glass bowl and microwaved it until hot. By the way, I realized spinach leaves were too big so I had to tear them into smaller pieces. I know, it’s that kind of improvisation that makes me feel like a true chef. I don’t know why so many college students (and normal people) rely on pre-packaged food. Even without a fridge or microwave, it’s entirely possible to eat well. If all else fails, buy some bananas at least. I mean, I’m pretty sure you can’t get Snickers, Lay’s, Oreos, or even Ramen as cheap as 60¢ a pound. And you know what? Prepackaged stuff is only faster by a matter of 10 or 15 minutes, aka that extra time you spend every day Facebook-stalking that one kid from elementary school. And I’m sure we can both agree that souped-up soup is more satisfying than the weird pictures on your stalkee’s Facebook profile. But only by a little. 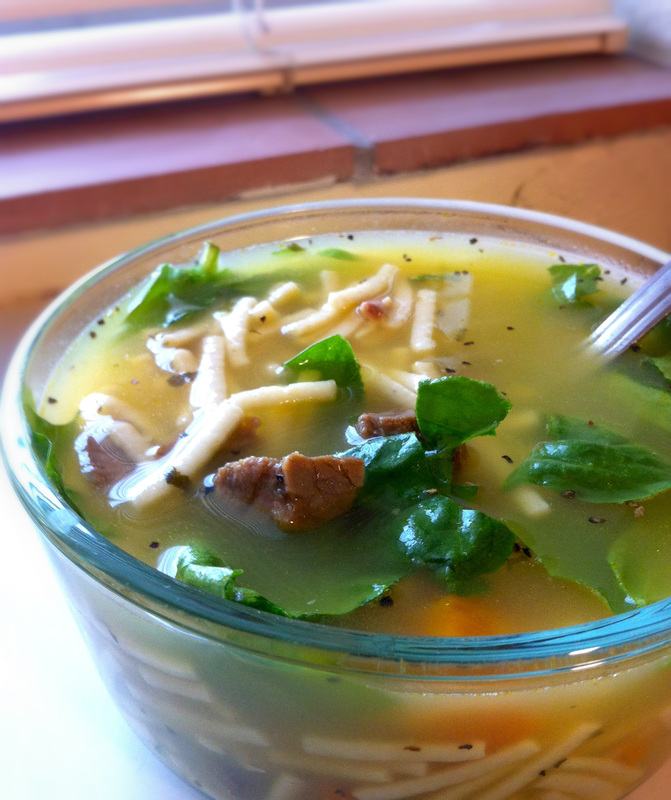 I could’ve has this soup a couple of days ago when I was sick too. Amen, that is exactly how I feel about people and prepackaged food! It’s not that hard to stock up on fresh fruits, vegetables, and if not, at least some nuts and bread or something is better than cup-noodles. Through my first year of college, I could not count how often my dormmates ate instant noodles and bags of chips. I refused to. (And I also don’t see the point of instant oatmeal when cooking regular oats in the microwave is just as easy). What a simple way to spice it up! Why thank you! Chicken soup is the spice of life.